Citrus are wonderful additions to any yard. 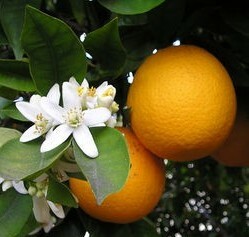 Attractive foilage, fragrant flowers, and delicious fruit are just some of the reasons to plant a citrus in your yard. Below is some information about citrus and the varieties when often have in stock. To learn about how to care for your citrus to have healthy trees and delicious fruit, visit our Citrus Care Guide Page. Citrus do best grown in a full sun area. If they must be planted in a somewhat shady area, try to place them in a location that will be sunny in the afternoon. Also, it is important that citrus are planted in soil that drains well. 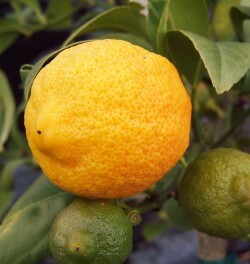 So plant your citrus slightly raised if your yard tends to hold the water in the winter or plant them in a raised bed. Many citrus also do well grown in containers. Citrus are available year round in containers. They can be planted just about any time of the year in our area. However, if you had to pick a month when we discourage planting, it would be January. January is usually the coldest month and this is when citrus receive the most cold stress. Of course, this is not always the case. When deciding on what type of citrus to plant, consider what type of citrus you enjoy most and also consider what times of year you want to harvest your fruit. Most citrus ripen in the fall and winter months with some varieties ripening in the spring and early	summer. Below are a list of some of the varieties of citrus that we carry year round. Washington Navel Orange - This is the most popular navel orange and most widely grown. It ripens during the winter months. Cara Cara Pink Navel Orange - This relatively new cross of navel orange is gaining popularity with its great flavor and pink flesh color. Lane Late Navel - This delicious navel orange usually ripens 4 to 6 weeks after the Washington Navel Orange. 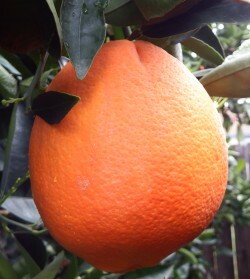 Trovita Orange - This is a spring ripening orange. It has great flavor and has few seeds. Valencia Orange - This is the standard juicing orange. It has great flavor and ripens in the late spring to early summer months. Very juicy. Midnight Valencia Orange - This has the same great characteristics of the Valencia except it ripens a little earlier and has no seeds. 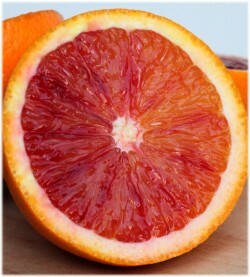 Tarocco Blood Orange - This is the largest fruit among blood oranges. Excellent tasting flesh is spotted red; orange skin. Sanguinelli Blood Orange - The fruit is generally oblong and holds well on the tree. Deep red, nearly seedless flesh, almost berry like flavor. Early ripening. Moro Blood Orange - Darkest of all the blood oranges. Develops red color even in coastal areas. Sweet and juicy, few to no seeds. Mandarins are sometimes referred to as tangerines, and recently they have been given the name "Cuties" in the supermarkets. "Cuties" is not a specific variety of mandarin. 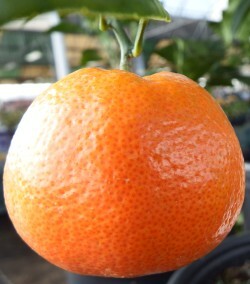 Basically any variety of mandarin in season that fits the growers criteria may be called a "Cutie". Owari Satsuma - One of the hardiest mandarins. Fruit ripens in November - December in Northern California. The fruit is medium sized, seedless, and has loose easily-peeled skin. The taste is mild, sweet, and juicy. This is one of our favorites. Shasta Gold - Fruit is seedless and moderately large size. Rich and sweet flavor when mature. Ripens in Spring. Tree growth is vigorous. W. Murcott - Fruit is tender, juicy, mild and sweet. Sometimes called Florida Honey. Ripens in Spring. Contains some seeds. Gold Nugget - Fruit is seedless, richly flavored and easy to peel. Fruit ripens in Spring and can hold its fruit into the summer. Also very cold hardy. Tahoe Gold - This moderately vigorous mandarin produces large oblate fruits that have an attractive dark orange rind that is relatively thin. The flesh is seedless, bright orange, finely-textured and juicy. The flavor is rich and sweet when mature. Ripens late January to late February. Tango - This is a University of California introduction. It's a Clementine type and is basically W. Murcott without seeds! Deep orange colored fruit with sweet flavor. Ripens in January, and fruit holds well on the tree into April. Meyer Lemon - Also known as Improved Meyer Lemon. Sweeter than Eureka and Lisbon lemons, very juicy. Cold hardy and bears almost year round once established. Grows well in containers. 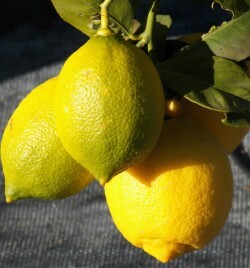 Eureka Lemon - Highly productive, bearing fruit year round once established. This is a major grocery store variety. Medium sized yellow fruit, nearly seedless, and acidic. Vigorous grower. 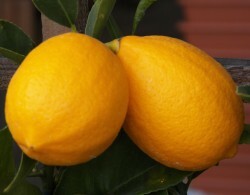 Lisbon Lemon - Fruit is very similar to Eureka. Plant is thornier. Produces year-round crop. Slightly more vigorous than Eureka lemon. Genoa Italian Lemon - Introduced into California from Genoa Italy in 1875, this variety has similar characteristics to Eureka. Bearss Seedless Lime - True lime. Fruit larger than Mexican lime. It is nearly seedless and one of the most popular in our area. More cold tolerant than Mexican Lime. The Bearss lime is sometimes referred to as ‘Persian’ or ‘Tahiti’ elsewhere. Kieffer Lime - Popular in Thai cooking. Leaves are used as flavoring as well the juice and rind. Flowers can be used in tea. The Kieffer Lime is a frost tender tree. Sometimes called Kaffir lime. Rangpur Lime - Vigorous, very productive cold hardy tree. Reddish orange rind when ripe with orange flesh. Tart, juicy and acidic. Ever-bearing in mild climates. Though classified as a lime, it is a sour mandarin cross from India. Mexican Lime - Very frost tender. Often referred to as key lime. Fruit is small in size, green to yellowish fruit with very juicy aromatic, flavorful acid flesh. Kumquats have sweet, edible skin and tart flesh, few to no thorns, and fragrant blossoms. They are very cold hardy and grow well in containers or in the ground. Meiwa Kumquat - Fruit is more round than Nagami, with a little more sweetness. Produces well in hot climates. Nagami Kumquat - Probably the most widely available kumquat in North America. Olive size and shape, bright orange fruit. Late winter or early spring ripening fruit. Chandler Pummelo- This is the standard for commercial pummelos. Very large, yellow fruit with very thick skin. Pinkish flesh has a very sweet flavor. Usually seedless. Oro Blanco Grapefruit - A fantastic tasting grapefruit. Considered one of the sweetest. It's a Pummelo x Grapefruit hybrid. Nearly seedless, white flesh. Produces well in cooler climates. 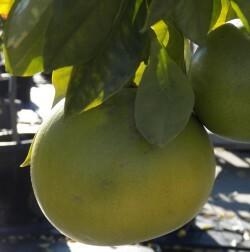 Marsh Grapefruit - Excellent quality white grapefruit. Large, thick-skinned, juicy, seedless flesh. Fruit holds well on tree. Rio Red Grapefruit - Developed in Texas. Excellent commercial variety of pink blushed, seedless fruit. Fruit develops color in both coastal and inland regions. Fruit ripens in winter and often holds the tree into fall. Wonderful for juice or eating fresh. Star Ruby Grapefruit - Large, blushed, thick-skinned fruit with seedless ruby red flesh. Compact tree. Frost sensitive. Blushes well in coastal zones. Minneola Tangelo - Mandarin x grapefruit. 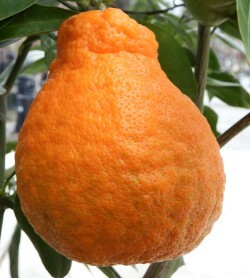 Large redidsh orange fruit with prominent neck. Peels easy. Juicy with few seeds. Unique rich tart flavor. Ripens in late spring through early summer. Calamondin - Often known as Kalamansi(Calamansi) or Phillipine Lime. It is a prolific producer. 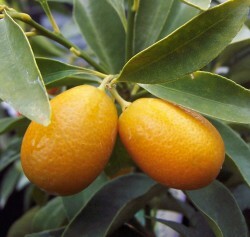 The fruit is larger than a kumquat, with sweet rind and juicy, tart center when ripe. Great for flavoring foods and beverages.